The Mega Bundle 2 is a fantastic assortment of 32 embroidery design collections, with over 640 embroidery designs. Purchased separately, these embroidery design collections would cost $1,560, making Mega Bundle 2 a truly Amazing Deal. All designs may be sewn and sold - perfect for small businesses! Do you own the first Mega Bundle? Mega Bundle 2 features 32 collections not found in the original bundle. Since you already know how great it is to have such a wide range of designs in this convenient format, you´re sure to want Mega Bundle 2 to round out your embroidery design library! 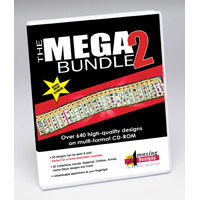 The Mega Bundle 2 comes on three multi-format CD-ROMs, with a bonus disk including FREE 30-day Trials of Edit N Stitch 2.0, Personalize N Stitch 2.0 and Digitize N Stitch!